What a breathtaking spectacle. 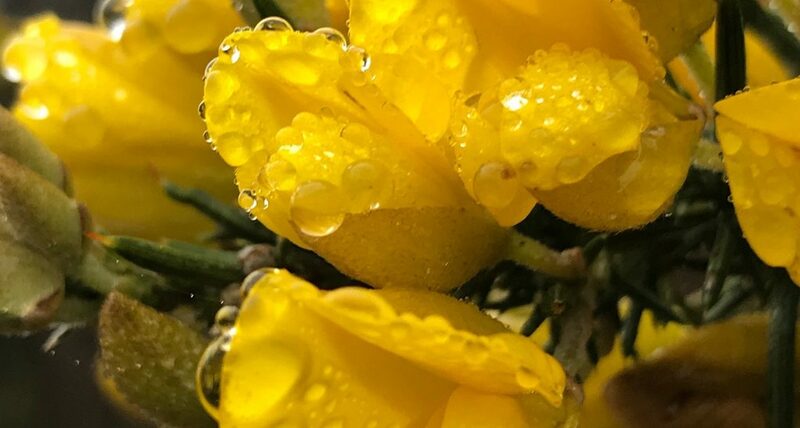 I noticed these dew drenched gorse flowers on my walk up the valley earlier in the week. And was smitten. How could this simple flower be so utterly beautiful? I took a number of pictures on my phone as my jaw dropped further to the ground. Intoxicated by the sight. The orbs of water clustered like jewels. Delicately balanced, even as the bush swayed gently in the light morning breeze. The vastness of the sky reflected in a single drop. The sheer aliveness of the bright buds. Their yellowest of yellows left an imprint on my inner eye, long after I had walked on. In our valley, the gorse bushes are almost weeds. Springing up and taking hold anywhere they have the chance. Yet they provide colourful displays through most of the year and valuable feeding for the butterflies, bees and other insects. And that’s the other side of reality here. The thorns. They are viciously sharp and strong. Protection for the birds and butterflies comes at a cost. Both the alpacas and dogs easily pick up old, brittle branches in their fleece and fur. Once a gorse bush has become established, it’s a real challenge to get rid of it. It’s hard to get near the base to cut it down or pull it out. The thorns tear at your skin and clothes mercilessly. Along with others, I am sensing the urgent need for a different level of wisdom in our world. This week, in particular, has brought this to the fore. Not the grasping for simple answers ‘to make everything alright’. But integrity and empathy that goes to the place of reality and has something worthy to say. We need humility to cultivate a new thirst for wisdom and the courage to find our voice. Not to shout or diminish, but to show a different way that recognises the thorns as well as celebrating the flowers. This is a job for the poets. Those who would craft a transcendent language and speak truth and love. Surely this is the place of true vocation: “…where your deep gladness and the world’s deep hunger meet.” Frederick Buechner. … Now just how do our alpacas manage to eat those fleshy gorse flowers without getting stabbed by the thorns…? Wednesday: Why are we here?